The SpongeBob Movie: Sponge Out of Water is now showing in Australian cinemas and is distributed by Paramount Pictures. Don't be too quick to reject The SpongeBob Movie: Sponge Out of Water if you haven't seen the incredibly successful television series, "SpongeBob Squarepants" that it is based on. The movie is in a rare category that considers those who haven't seen the television show and ensures that these members of the audience not only have an understanding of the characters and story, but also enjoy themselves and have more than a single chuckle. 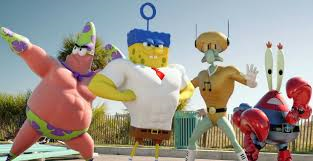 The beloved sponge who lives under the sea, SpongeBob Squarepants (voiced by Tom Kenny) is caught up in a battle involving Bikini Bottom's fast food rivals Mr Krabs (Clancy Brown) and Plankton (Mr. Lawrence). Things come to a head when Plankton steals the secret to the famous Krabby Patty and when SpongeBob teams up with Plankton in a shock partnership, they try to go back in time via time machine to stop the theft and make some incredible discoveries, the biggest which involves narrator, the pirate Burger Beard (Antonio Banderas). The SpongeBob Movie has to first and foremost be commended for not neglecting those who have never watched the "SpongeBob Squarepants" television series which first aired in 1999. The inclusion of narration in the film by Burger Beard is not just for the benefit of the seagulls he has befriended, but is a clever way of ensuring that everybody in the audience has the same knowledge of the characters and the oceanic world in which they exist whether they were SpongeBob fans prior to seeing the film or not. This is a rare quality in television to film adaptations and one that many will appreciate. However, whether you have seen SpongeBob previously or not does not take away from the fact that both the television show and the film are an acquired taste. This does not mean that the film is offensive in any way, but rather that it is quirky in its own unique way. It's quirkiness can be interpreted as stupidity for some, but other's will find the citizens of Bikini Bottom hilarious. For these people there will be a great deal of laughs to be had over the course of the film and the strangeness of the situations SpongeBob finds himself in will be a lot of fun. The story itself requires acceptance in the bizarre as there really is nothing normal about some of the situations they find themselves in and there are many scenes in the film that can only be described as random in their content as they have nothing to do with anything else (such as the dolphin time wizard who keeps watch over the planets in the solar system). The SpongeBob Movie is 3/4 animation and 1/4 live action. As a result of this uneven balance between the two, the film feels like a lengthy episode of "SpongeBob Squarepants" with a live action segment tucked in at the end. This is more of an observation rather than a problem, but will be a problem for those who enjoy the live action segment so much that they would have preferred to have seen more of this and for those who had walked into the film expecting a great deal more live action as a result of the advertising featuring more live action than animation. Either way the live action is a real treat. We know what to expect from The SpongeBob Movie as far as it's animation is concerned and from this aspect the film brings nothing new, but the live action does bring something new to the SpongeBob spectrum and sets it apart from other straight animated family films. It provides a 16 year old character with something original and fresh that makes this film well worth watching. The SpongeBob Movie: Sponge Out of Water is a bit of fun not only for children, but also for adults that appreciate it's sense of humour. 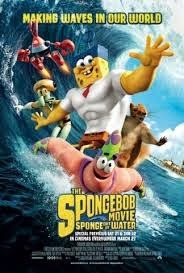 It is a film that will definitely delight long time SpongeBob fans and may even create some new SpongeBob fans in the process.